Records show at least three lockdowns each in Prince William Co., Montgomery Co., Frederick Co, and and Anne Arundel Co.
Manassas City Public Schools locked down an elementary school in March 2015, as police investigated reports of a person with a firearm. Prince George’s County Public Schools locked down four schools Feb. 29, including Duval High School, after a shooting on a nearby street. Washington, D.C.-area public schools ordered at least 30 lockdowns since 2014, according to a review of security records by the News4 I-Team. A lockdown, a security measure often used when police report weapons or threats near school buildings, requires students to be secured inside classrooms and an elaborate regimen for principals and administrators. A shooting outside Frederick High School in February 2015 triggered a two-hour lockdown of students, parents and fans attending a junior varsity basketball game. The crowd was ushered out of the gymnasium and into team locker rooms, which were deemed to be “safe rooms,” until police determined the building and surrounding property was safe for the crowd to exit. School security records show at least three lockdowns each in Prince William County Public Schools, Montgomery County Public Schools, Frederick County Public Schools and Anne Arundel County Public Schools since the 2013-14 school year. Manassas City Public Schools locked down an elementary school in March 2015, as police investigated reports of a person with a firearm near school grounds. According to prior reporting by News4, Prince George’s County Public Schools locked down four schools Feb. 29, including Duval High School, after a shooting on a nearby street. Lockdowns are only called when there is an imminent danger immediately outside school buildings, Montgomery County Public Schools head of security Bob Hellmuth said. “Teachers come out into the hallway and do a scanned sweep,” he said. Staff would move students into the nearest classroom, lock classroom doors and pull down classroom curtains, he said. 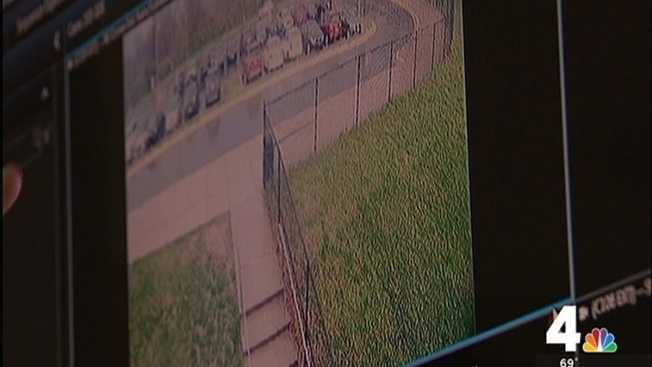 The I-Team documented an April lockdown drill at Walter Johnson High School in Bethesda, Maryland, one of almost 300 lockdown drills conducted by Montgomery County Public Schools this year. Assistant Principal Terry Heintze operated a command room out of a school office, radioing teachers or staffers throughout the building to confirm hallways were fully cleared of students. Inside Montgomery County Public Schools central offices in Rockville, Hellmuth and his security team can monitor the execution of a lockdown or lockdown drill by watching feeds from some of the thousands of security cameras the district has installed inside and outside the district’s school buildings. Hellmuth’s unit also has roving, patrolling security officers to monitor school grounds and lockdown procedures. Local school districts have a lower-level security procedure when a potential threat is near school buildings. Partial lockdowns, also referred to as lockouts or secure-the-building orders, prohibit people from entering or leaving school buildings. In each local district reviewed by the I-Team, partial lockdowns do not alter the school day inside the schools; students continue to attend classes as normal. The I-Team’s review of school security records shows at least 200 partial lockdowns ordered since 2013 in D.C.-area public schools. Public school systems in Prince George’s County, Fairfax County, Allegany County and Washington County said they did not have data available showing the number of school lockdowns or “partial lockdowns” in recent years. Local school districts conduct regular drills to practice lockdown procedures. “I think that students do take it seriously, because even though it is a really safe school, we hope nothing serious or tragic might happen,” Walter Johnson High School junior Abraham Kim said. “You don’t realize the importance (of lockdown drills) until something happens to your school and it happens to your friends,” freshman Rozhina Amini said.